NEW Walt Disney World Discounts for Spring 2015! It’s NEVER too early to plan a Disney Vacation! Are you thinking about a 2015 trip to Disney World in Orlando or Disneyland in Anaheim? If the answer Is yes then stop thinking and start planning! On July 30 Disney will release its package pricing for 2015 travel. That means you will get the prime choice of resorts for your travel dates, and the best part is the only requirement to hold your reservation is a $200 deposit! I know you were probably thinking it would cost much more to start planning a Disney Vacation. Of course there are no discounts out yet for 2015 travel, but that is one perk to letting me help you plan your vacation. If a discount does come out for your travel dates I will automatically apply it and save you money! 3. Save you time by booking your resort, flights, transportation and more! 5. Stays on top of the latest discounts direct from Disney and applies them to give you the best deal possible, even after you have booked! Will you be going to Disney in 2015? 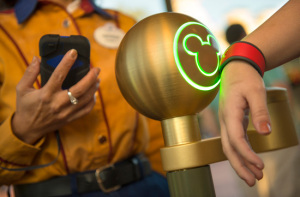 I just returned from a long weekend at Walt Disney World and boy do I have a lot to talk about regarding all of the new RFID systems and updates! Plus, I am sure that everyone is just clamoring to know how it worked. I am going to go through how mine worked for me. Next trip will be different because I will have package and can pick my fast pass options before I leave. Being a TA I had to pick my tickets up for this trip at will-call, so I was all set to just “roll with it”. As as Disney Travel Agent I have been well versed and trained on the new systems. But I don’t think anyone can really learn something until they are able to use it. Thankfully Pop Century was in testing phase for my visit! Yay, I love being a guinea pig. Having been to Disney many times trying new things doesn’t phase me much. I was however a little intimidated by this new system before my arrival. Let’s start at the beginning with My Disney Experience , this is the site you will use from now on to manage all of your reservations. You can link rooms, tickets, dining and even add daily notes or plans. I like this site personally, seems user-friendly and easy to navigate. It is also available as a FREE App for I-Phones to use in the park to manage reservations, look up real-time waits and change fast pass + options, Once all of your reservations are linked and about 60 days before arrival you will order and customize your magic bands. The Magic Bands will come in the mail. be sure to pack them in a ziplock bag in carry-on, you will need them now for Magical Express. Now we skip ahead after 2 hour flight, I am at Disney’s Magical Express. Oh why yes I do have my magic band and not the booklet (said in my Disney princess voice to the CM) And he replies, just tap here and when it turns green you go to your line! Well that was easy. My turn to get on the bus..why yes I do have my band, tap and go on the bus please. Step 1 was a success. Alright this system is pretty cool. 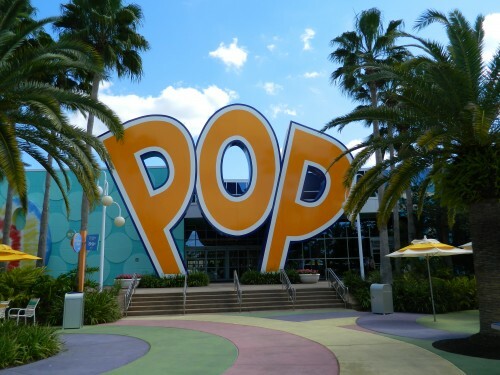 Hello and welcome to Pop Century! I had set up online check-in before my arrival, I would suggest this to ALL guests right now. With so many guests being in the dark about the new system the check-in wait times can be up to 2 hours during peak arrival because the CM’s at front desk have to activate and explain the bands. You can even set a pin code online for your band for room purchases ,you verify the pin at check-in and you are set. I zipped right through online check in and was off to my room (5360 is a great preferred location at POP). You have to wiggle the band a little around the wrist to get the room key to activate, I often found it easier to just take it off to get in the room with the Magic Band. So far so good. We had park tickets for Mickey’s No So Scary Halloween this night. I had linked the ticket to my band before I left. We just arrived at the parks, scanned bands and fingers and off we went. I also picked up the rest of my tickets for the weekend at will call and was able to link them to My Disney Experience in about 3 minutes from the phone app. Then I made Fast Pass + choices for the next day. I found this to be great, if you aren’t planning around meals then you can basically pick anytime that works best for your park day. Just pick 3 attractions and schedule in advance. I was able to get Rock N Roller Coaster and Toy Story the night before I went to the parks. That works for me! I was super lucky to have no issues what so ever with the App, Bands or Fast Pass +. My biggest complaint would be the bands are a less like a bracelet and feel a bit awkward on the wrist. I did notice that after midnight the app would “shut down” or something, I couldn’t get anything to update or upload. I saw plenty of irritated guests that hated this concept, even to the point of screaming at CM’s because it didn’t register the park tickets. I fortunately was not one of those guests. People are forgetting that this is still in TEST MODE and will need to have kinks worked out before it is 100% functional. You can always get a Key To The World card and not use the bands if you wish. But the Fast Pass + will not be an option without the bands. Here is a tool I am sending my guests to help understand the system a little better https://www.youtube.com/watch?v=Y09af1jVYs8. Please let me know how you felt about using this new technology if you were able to, and if you haven’t yet are you looking forward to it? Jennifer is a Disney Vacation Planner with Destinations in Florida Travel, Authorized Disney Vacation Planner. Contact her at jenniferg@destinationsinflorida.com or 443-424-0181 for your FREE quote!